Watch the video to learn how we help our children develop ‘Positive Relationships’ during their early years. 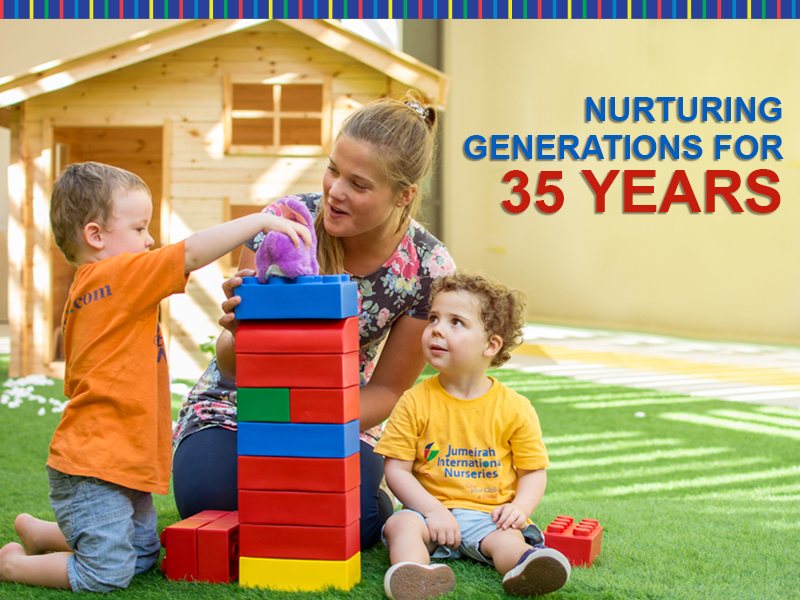 Jumeirah International Nurseries, (JINS), is one of the leading and most trusted nursery chains in Dubai, with more than 3 decades of experience in early education and childcare. Our curriculum is based on the Early Years Foundation Stage framework of the National Curriculum of England and is enriched through ‘Positive Education’ which uses the science of Positive Psychology and happiness to enable children to flourish. With a perfect balance of child-initiated and adult-led activities, JINS enables your child to experience positive emotions, engagement, purpose, relationships, accomplishments and health. Our teachers are highly qualified, British educated and committed to nurturing your child. +35 years of experience in early childhood education. Follow the globally reputed British EYFS framework enriched with our proprietary programmes in MultiSmart LearningTM, Education in Human ValuesTM and language immersion. Curriculum integrates the philosophy of ‘Positive Education’ to help children flourish from the beginning of their learning journey. Caring teachers committed to nurturing your child’s development and learning. Daily communication with parents via our Early Years Mobile App through photos, videos and direct messaging. Bilingual and trilingual language programmes. State-of-the-art facilities that ignite the imagination through play zones, sports facilities, an organic vegetable garden and multiple role-play discovery zones. Flexible hours from 7.15am to 6pm designed for working parents. Flexible payment options: yearly, termly or monthly. Bus transport routes servicing all the major communities in Dubai. Nutritious hot meals service from a reputed catering company. Strong parent engagement programme - open door policy, weekly newsletters, quarterly parent teacher meetings and parent workshops. High level of safety and hygiene including CCTV cameras, code locks, first-aid trained staff, on-premise nurse and a visiting doctor. Priority placement at Fortes Education’s schools which are leading schools in the UAE.